We have just been plodding along rather merrily since my last update. Lee has enjoyed his first few days in his new job, travelling all over the place, and learning a lot. The first home-ed group on Monday without him was strange but enjoyable. I'm very lucky in the fact I can still have the car whilst he's working, but it does mean getting used to driving again! The Monday meet was held at Dawlish Warren, which is one of my favourite local places. With a Nature Reserve to explore, sand-dunes to climb up and down, and a beach to enjoy, it's pretty much perfect. The group itself was a little smaller than usual (24 adults and children), but it did mean that I got to chat to people more in depth than is possible during our bigger meet-ups. And we got to picnic on the beach as the sun shone overhead - can't get much better than that! During my "me time" I've been busy stabbing things randomly in the hope that it may form a shape and become something recognisable. 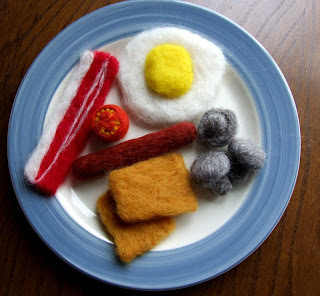 Of course I'm talking about my new found appetite for needle felting. I have just set up a brand spanking new shop on Etsy (not much on there at the moment, I'll be adding daily), and I'm blogging progress updates here: Scatty Dolly (shameless plug I know, but I'm sure you lovely lot don't mind...) I'm well aware that I won't get rich, but hey, every little helps as they say. What's lovely about needle felting is the way I can combine my love of crafting, with my passion for children and play. Imaginative play, role-playing games and the like, are fast in decline so it seems, and I find that so sad. It appears now that toys needs to have loud sounds or flashing lights/images in order for them to appeal to some children, as the computer age rapidly takes over little minds. Vanishing are the days when a wooden cooker (or cardboard box one!) are cherished by little ones and fierce imagination took over - now things need to have sizzling sounds, and real pumping water at the sink to be of any interest - or is it adults that *think* such add-ons are needed. Is it because something seems "boring" within our own minds that we feel the need to ooomph the interest up for the children ... hmm, ponder ponder. I am hoping to make items that children will enjoy touching and making. Not the cold to touch, hard plastic bits and bobs so readily available at every turn, but things that will cry out to be touched and used. Plans for this afternoon include family reading time, spider project for Tiegan, Roman research for Chelsea (she has just watched a TV documentary about Roman Catacombs and it's sparked an interest - yay! ), Callum is using the laptop, and Joseph is tidying his room then .... not sure what. Hope everyone is tickety boo and diddly pop. Have you ever done any reading around Steiner/Waldorf - there's masses of blogs out there from waldorf parents, mostly American. There's a lot in it that I think would chime with you - natural toys being one, preservation of childhood, not forcing early academics etc. If you get too deeply into it some of the ideas are a bit far out, but the main points are definitely worth a read - the parenting passageway is a good place to start if you are interested. Love the breakfast :) I'm looking forward to seeing one of the life cycles that you've previously mentioned.